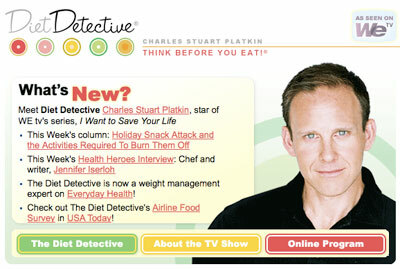 Diet Detective Charles Stuart Platkin, star of WE tv’s series, I Want to Save Your Life recently interviewed me as part of his series of Health Heroes Interviews. Charles Stuart Platkin, PhD, MPH, is one of the country’s leading nutrition and public health advocates; his syndicated health, nutrition, and fitness column appears in more than 100 daily newspapers nationally. He is also the founder and editor of the health and fitness network, DietDetective.com (part of the Everyday Health Network), which offers nutrition, food, and fitness information. Diet Detective: Hello Jennifer, thanks again for the interview. You’ve had so many great accomplishments in your career – it’s exciting. How did you get so involved with healthy cooking and nutrition? Was it an early passion? What was your motivation? Jennifer: I grew up in a family of food fanatics, outstanding cooks and passionate, overindulging eaters. Food is my great love and in the past has been my greatest enemy. I grew up as an overweight teenager and young adult, always fighting weight problems in the midst of a family where everyone was obese. Food has always been central in my life and when I became a chef, I realized that my passion for food could be healthy instead of problematic. Jennifer: I don’t believe that cooking healthy is difficult. It’s more about the choices you make when you shop and get to the stove! Cooking with low-fat dairy products, such as low-fat mayo and cream cheese, takes the same amount of time and you don’t need any special skill to make the swap. Healthy food doesn’t have to be bland either – fresh herbs, spices, and using salt correctly can make low-fat food taste incredible! My number one healthy cooking tip? Watch the fat. Until you know how to eyeball a tablespoon of oil or butter, just have a measuring spoon handy. Adding too much fat or not enough fat is the home cook’s downfall. Jennifer: Professional chefs use lots of fresh herbs and cook with wine. Home cooks might be intimidated by cooking with wine or feel it’s too “fancy”, but using a little wine in a sauce can add major flavor without any fat, at around 100 calories per cup. Fresh herbs are loaded with antioxidants, antibacterial agents, and most of all, flavor. Tuck in a handful of basil for a burst of flavor in pasta sauce, on pizzas, and even on a sandwich or in soups. Diet Detective: If you had to pick one or two healthy cookbooks to recommend which would you choose?